A Chinese Long March 2D rocket launches a land survey satellite into orbit from Jiuquan Satellite Launch Center in the Gobi desert on Jan. 12, 2018. A Chinese Long March 2D rocket launched a new Earth-watching satellite Saturday (Jan. 12), marking the country's third launch in four days. 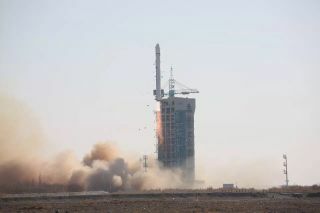 The Long March 2D booster launched from China's Jiuquan Satellite Launch Center in the Gobi desert at 3:10 p.m. Beijing Time (2:10 a.m. EST/0710 GMT), the state-run Xinhua news service reported. The rocket carried the new Land Survey Satellite 3 into orbit, according to a translated statement from the China Aerospace Science and Technology Corporation (known as CASC). The satellite will be used for remote-sensing of land resources, according to that statement. Saturday's launch marked the third Chinese space mission in a week, and second Long March 2D launch in four days. A Long March 2D booster launched two SuperView-1 Earth-observation satellites into orbit from the Taiyuan Satellite Launch Center in China's Shanzi province on Jan. 9. On Friday (Jan. 12), a Long March 3B rocket launched two Beidou navigation satellites from the Xichang Satellite Launch Center in the southwest Sichuan Province.